Bowl turning is an American tradition that began over 150 years ago when wooden bowls were an important part of everyday life. All wood bowls were skillfully turned and greatly valued. Today, turning wood bowls is a vanishing art form, with Holland Bowl Mill being one of only a few commercial producers left in the United States. The Holland Bowl Mill was originally started as the Wooden Shoe Factory in 1926 by Chester VanTongeren and to this day is still owned and operated by Chester’s relatives. In 1984 the Holland Bowl Mill became a separate company whose current president and owner is Dave Gier, Chester’s grandson. The bowl mill is located in Holland Michigan, near the shores of beautiful Lake Michigan. Because of increasing demand, plans were developed to move and expand the bowl mill in the summer of 2000. With over a year of planning, moving, designing new equipment, and training new craftsmen, the company opened the doors to a new bowl mill production facility in March 2002. The Holland Bowl Mill is now the best and largest solid wood bowl production facility in the world, making beautiful solid hardwood bowls of the highest quality, the same way they were made over 150 years ago. 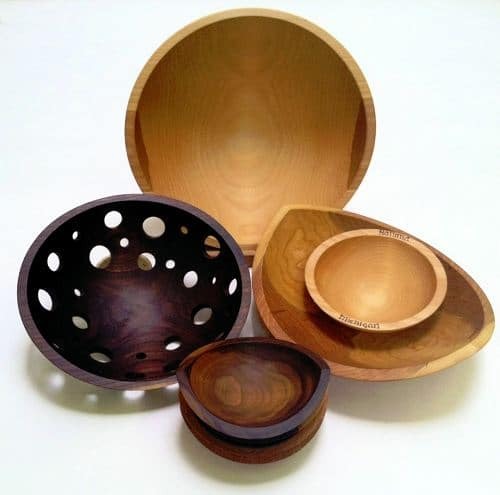 Holland Bowl Mill manufactures many sizes of beautifully grained wooden bowls. Additional plans are under consideration to expand the product line to different wood bowl shapes and adding other useful wood products.